AKEL denounces the murderous violence of the Israeli forces who are firing indiscriminately and killing dozens of civilian Palestinian protesters. The Palestinians are demonstrating on the occasion of the 70th anniversary of their uprooting, but also against the US decision to transfer their embassy to Jerusalem. Today alone, the number of Palestinians murdered so far has reached 41 and the injured 2,000. Trump’s administration, basing itself on the US’ long-standing policy in the Middle East, is proceeding to take even more provocative and aggressive actions both with regards their Embassy in Israel, as well as with the unilateral withdrawal of the US from the agreement on Iran’s nuclear program. Tramp has revealed the true face of American imperialism, which for decades – for the sake of its geopolitical designs and the profits of the arms industries – has turned the Middle East into a region of ​​endless bloodshed and devastation. AKEL expresses its unwavering solidarity with the struggling Palestinian people who are militantly resisting the new fait accomplis against them. 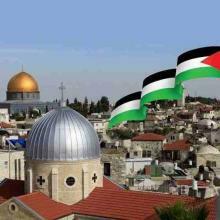 However, the peoples of the world know that the Palestinian people has not surrendered or will surrender neither to the violence of the occupying power, nor of its allies until the day of the declaration of an independent Palestinian state on the 1967 borders and with East Jerusalem as its capital.